Best Buy Weekly Ad & Sales. 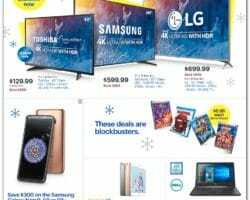 Check out this week Best Buy Ad sale prices, printable coupons, current circular savings and latest specials. Best Buy is a top consumer electronics company in the country where kids can use free Wi-Fi and play free games in the phone section and shoppers can purchase online from an extensive range of items and choose home delivery or store pickup for more efficient experiences. The store sells most sought out electronics and most popular brands with lower prices every day and runs discounts of up to 30% off for latest technology televisions, has iPhone offers with $200 gift cards on a regular basis, hundreds of dollars savings for MacBooks, and up to 25% off top appliances online and in stores. In addition, they provide one-day only Deal of the Day, price matching and free shipping for orders $35 and more, with bonus web deals such as $190 savings for Shark Bagless Upright Vacuums, free $10 gift card and $35 savings with select H&R Block Tax Software, half-price Insignia batteries, limited time offers for HDTVs and laptops.